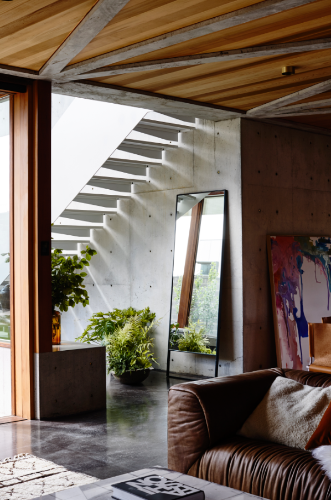 The raw, monumental qualities of concrete have been used to define an award-winning new home on Victoria’s Surf Coast, south-west of Melbourne. Designed by Kate Fitzpatrick and Ben Stibbard of Auhaus Architecture, the Torquay House combines raw grey concrete finishes, natural hardwood surfaces and the expansive use of glazing to create a home that is as unique and inspiring as it is functional and low maintenance. Every concrete feature in the home, from the fireplace and kitchen benchtops to walls, polished floors and ceilings, is off-form – and for one simple (and practical) reason. The owner is a concretor. Ben Stibbard says the home’s design deliberately played to the owner’s core skill-set and the Auhaus philosophy. “We design from fundamental principles - light, orientation, airflow. They’re our starting point for any project,” he says. Tightly hemmed in by suburban houses but backing onto wetlands and a golf course, the Torquay House is treated as a walled sanctuary, opening up into itself. At street level, an open carport and art studio above invite filtered views through battened hardwood. Entry is via a portal in the concrete wall, leading into a small, secluded courtyard which acts as an antechamber to the more private areas of the house. Inside, the space immediately opens into a double height gallery, glazed on one side to reveal the plan which wraps around a large central courtyard. Exposed concrete walls feature inside and out, with the imprint of ply formwork testament to the off-form construction. An element of refinement has been added, with Z-bar holes highlighted via the use of brass tubing, cut flush to the surface and sealed with brass caps. The ground floor is built on two slabs, one on top of the other. The first slab is a structural slab while the second carries the hydronic floor heating. A layer of rigid insulation is sandwiched between the two to prevent heat loss through the structural slab into the ground. This meticulous approach maximises the heating efficiency of the hydronic system, with the home interior reaching a comfortable temperature in a matter of hours. The orientation of the home and positioning of the large windows, coupled with the employment of wide concrete eaves, also contributes to the design’s thermal efficiency by moderating the ingress of the sun’s warmth, according to the season. The ceilings over the ground floor living zones feature exposed concrete beams in a cross-over pattern, infilled with natural hardwood boards that hide the services and insulation and add to the overall appearance. Indeed, timber is used judiciously throughout the home – as insulated wall cladding, window framing and screening elements – both to reduce the scale of the overall design to something more domestic and to create textural balance. Adding another element of ‘warmth’ that complements the rawness of the concrete is a roof-top garden. Underpinning the design of the Torquay House is a very simple philosophy. “We design things to last,” says Stibbard. “We also don’t use a lot of applied finishes. We prefer more natural materials that age over time. “Concrete is one of those materials. It stands up to everything, including weather and time.